“Look toward the Most High and be radiant. Sister Mary Dorothy Spring was born on the 5th December 1923 in Melbourne, Australia to Mary Dorothy Spring, nee Jordan and Dr Edward Spring a member of a prominent medical family in Melbourne. Mary was the firstborn and was followed two years later by a sister, Helen and several years later by her brother Thomas. Mary’s early education was with the Faithful Companions of Jesus at Genazzano, Kew and at the age of sixteen, she made up her mind to be a missionary. Her parents were against this decision and could not understand why Mary would choose a missionary congregation over the teaching order she knew. Her father demanded that she attend University first but at the end of her first year, Mary’s lecturers concurred that Mary’s heart was not in the studies and so, her parents allowed her to discontinue university. Her mother found her a position at the Victoria Army Barracks because she felt Mary had been far too protected and needed exposure to different people. Eventually, when she was nineteen, Mary’s parents realised her mind and heart were firmly fixed on the Missionary Sisters of the Society of Mary and allowed her to go to New Zealand. A passage to New Zealand by boat was found with considerable difficulty due to World War II. On 2nd February 1943, Mary Dorothy Spring entered the postulancy in Wellington. On 15th August 1945, the day the war in the Pacific ended, Mary made her first profession of Vows as Sr. Mary Walter. Sister Mary Walter was immediately missioned to Samoa where amongst other services, she was the organist for the cathedral. Her ministry involved teaching in primary schools and giving piano lessons. Sister Mary spent time in New Zealand first doing teacher training and then completing a Science degree. She gained a great reputation for organising school concerts and musicals. 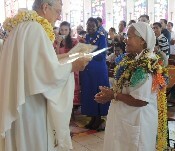 In all, Sister Mary spent forty years in Samoa teaching at Savalalo, Leauva’a, Lepua, American Samoa, Vaimoso and Falefa. During these years Sister Mary changed her name from Sister Mary Walter to Sister Mary Dorothy. Her only regret was that she felt she had been far too severe a disciplinarian but only with the good of her students in mind! 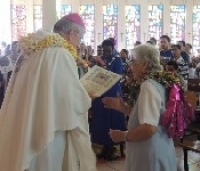 However, her ex-students did not remember it the same way: “This beautiful sister had dedicated many years of her Marist, Missionary, Religious life to teaching Science to many students of our Marist colleges in Samoa. She witnessed to Mary’s love and faithfulness in her teaching and community living. We remember her with heartfelt joy and gratitude…..”, “ my first appreciation and love of music began with Sister Mary Dorothy teaching and singing at Savalalo…..she spent many years in our education ministry here in the two Samoas and touched many lives”. 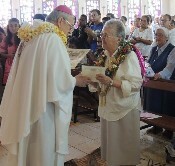 Sister Mary also learned the Samoan language so that she could converse with the parents of the children and saw this as an important part of her ministry. From 1974 to 1980, Sister was the Regional Financial Administrator. 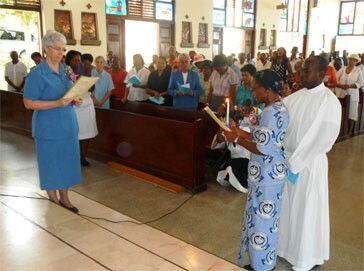 Following secretarial work at the 1987 General Chapter in Rome, Sister Mary was re-assigned to Fiji. In Fiji she became very involved in the Interfaith Search movement and made invaluable friends by her generous commitment. In 1993, Sister Mary finally returned to Australia to work on the Provincial archives and the Service of Prayer Ministry, an outreach to many lay people as well as SMSM. 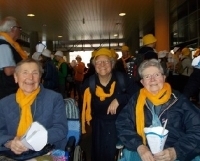 Sister Mary became a volunteer for a number of organizations: the Cancer Council of NSW, the Red Cross Cosmetic Care Programme at St Joseph’s Hospital, the Arthritis Foundation, Catholic Missions and the Catholic Women’s League. As one of the many volunteers during the 2000 Sydney Olympics and Para-Olympics, her name is inscribed at Olympic Park on a pole to commemorate the event. From 1996 onwards, Sister Mary lived in many places in Sydney, Lavender Bay, then Auburn for two years, next in Elsinore Street, Merrylands and then, to Lois Place until in 2007 Sister Mary transferred to the new community at Rydalmere. Sister Mary began to gradually discontinue her voluntary work as her short-term memory began to diminish. In 2013, Sister Mary had a fall near a busy road. A passing postman called the ambulance and Sister Mary was admitted to hospital with a badly fractured wrist. She was not able to return to community and was placed in aged care, first in Merrylands and finally in October 2013 in Our Lady of Consolation Nursing Home at Rooty Hill. Sister Mary’s short term memory continued to deteriorate. She lived only in the present moment with a graciousness and gratitude which won the love and admiration of all the staff. 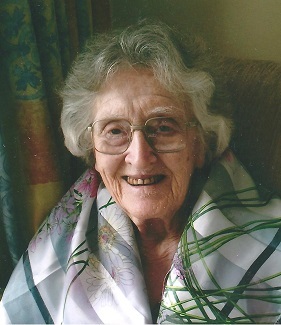 Despite her memory loss, Sister Mary was involved in many activities including art, flower arranging, poetry writing, Scrabble, Bingo and the monthly bus outings. She loved to have visitors. A month before her death, Sister Mary had a bout of influenza but appeared to recover within a week. However, it became obvious that her health was declining rapidly. On Sunday September 3rd 2017, as the Nursing Home notified us that Sister Mary was no longer eating or speaking but was conscious, Sisters Anne Baxter, Vicki Wilson and Janice Ruff went there at 9.00pm. 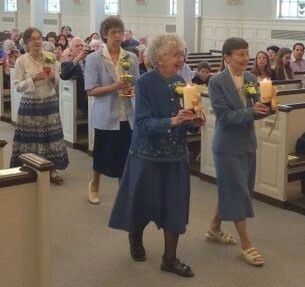 They renewed Sister Mary’s Vows with her and prayed the Rosary. Sister Mary indicated she could hear and recognize them and made a great effort to sign herself with the Sign of the Cross. The following day, after she had received the Anointing of the Sick, Sister Mary lay peacefully and without moving in her bed and was ministered to by the staff with loving care and tenderness. On the 7th September it was thought that Mary would probably not die for a few days, but at 2.00am, on September 8th, the nurse had just finished making Mary comfortable and had wrapped the rosary beads around her hand when Mary took one last breath and was taken into her eternal home. Two of Mary’s nieces, a nephew and a grand -nephew travelled to Sydney for the funeral which took place on September 15th, 2017. The Mass was celebrated in the chapel of the Franciscan Missionaries of Mary at Our Lady of Consolation and Sister Mary was laid to rest in the Pinegrove Cemetery. Minchinbury. Many of her former students in Samoa sent messages of condolence and one of those students represented them and spoke on their behalf during the eulogy. And indeed, Sister Mary Dorothy Spring kept her eyes on the Most High all her long life and we pray now that she enjoy the fullness of God’s blessings!